I have to admit, I wasn’t excited to pick up this book. Like, literally. Because it’s a pretty hefty hardcover. I figured it would be a pain to carry around, and I thought it would take a while to read because it’s so thick. But guess what — just like the two main characters in The Assassination of Brangwain Spurge by M.T. Anderson and Eugene Yelchin — I incorrectly judged the book by its cover. Or in this case, by its physical size. Because once I started reading, I ripped right through the book — in this case, figuratively and not literally, thank goodness or else my library would not have been happy! In the book, Brangwain Spurge is an elf sent from his kingdom to the land of goblins with a gift and a message of friendship and peace. The only problem is that the elves and the goblins have a long history of bloody warfare, hatred, and mistrust. And for good reason — as we quickly learn that Brangwain Spurge has orders to spy on the goblins and send secret messages back to the elves. Will he get caught? And what does this mean for his goblin host, Werfel, who is doing his best to befriend Brangwain Spurge despite pressure (not to mention death threats) from his fellow goblins? 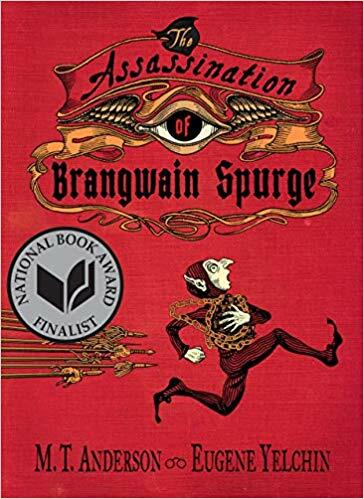 The story of Brangwain Spurge and Werfel is full of adventure, double crosses, double double crosses, politics, war, friendship, rivalry, community, and the importance of overcoming prejudice if there’s any hope for the future. In other words, it addresses some pretty serious topics — but it never drags or feels like a textbook. There’s tons of action and suspense to keep the plot moving, it’s darn funny, and a good portion of the book’s many pages are dedicated to illustrations (a welcome surprise to me!). I’d definitely recommend this book to anyone and everyone. It’s a no brainer for fans of humorous fantastical adventures like the Life of Zarf series and the How to Train Your Dragon books. But you’ll also enjoy it if you’re usually drawn to more serious epics about warring factions, like The Underland Chronicles and the Percy Jackson series. This book was a finalist for the 2018 National Book Award, which is a big deal. But as Brangwain Spurge and Werfel realize, it’s important to avoid blindly believing higher-ups and instead to have an open mind and learn for yourself. So why don’t you check out The Assassination of Brangwain Spurge for yourself and see what you think? If you’ve already read the book, please leave a comment below with your take. Or weigh in if you’ve also made the mistake of judging a book by its cover! If you’re a longtime fan of Kidsmomo, then you’ll recall plenty of times that Karen has misjudged a book before reading it, like here, here, here, here, and here. Seems like she’ll never learn her lesson!